The Indian aviation sector seems to be on a turbulent ride with airlines such as Jet Airways, Air India, IndiGo, and SpiceJet’s, struggle in dealing with financial and operational performances. Even though India continues to be the fastest growing aviation market in the world, with domestic passenger numbers clocking 18 pc growth in 2018, the aviation sector seems to be on a downfall ride. With airlines such as Air India, IndiGo, SpiceJet already struggling to fight financial headwinds, joining them in their struggle is now Jet Airways. With around 20,000 jobs at stake, the fall of Jet Airways might add to the woes of the Indian aviation sector. The sector is now dealing with major financial and operational challenges and struggling to stay afloat. The biggest problem that the aviation sector is facing now is the grounding of Boeing 737 MAX 8 aircraft. With the crashing of two Boeing 737 MAX aircraft in the span of six months that claimed over 300 lives, has led to the befalling in the Indian aviation. Following the crash, five countries including India decided to ground all 737 aircraft. SpiceJet has 13 planes of the model, while Jet Airways has five. 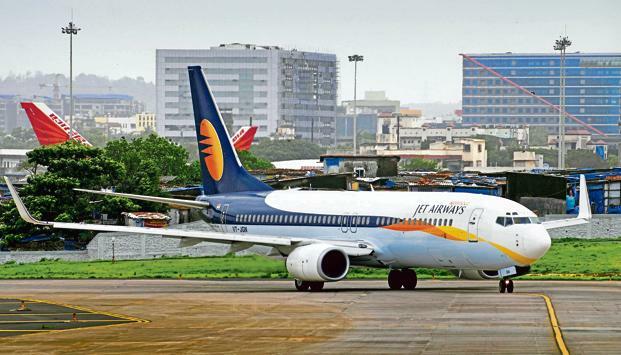 Also, Jet Airways in the first week of April has declared that it has grounded another 15 aircraft over unpaid dues to lessors. As per the Ministry of Civil Aviation the airline now has less than 15 aircraft in operation. That’s less than 20 pc of its original fleet of 119. Indian aviation sector has a long history of financial troubles and has been under periodic rough weather quite frequently. However, the situation worsened for the sector after the depreciation in the rupee last September. Since 70 pc of the airline costs is dollar-denominated, even a slight depreciation in the rupee affects the cost structure of operators, that includes aircraft lease rents and maintenance costs to ground handling and parking charges abroad. Also, the aviation turbine fuel (ATF) costs are big a pain in Indian carriers’ necks. Aviation fuel accounts for more than half of the costs of an airline company. The central government charges 14 pc excise duty on ATF plus the state governments pile on their own sales tax that can total up to 30 pc, thus leading to increase in operational costs. Since the major airlines like Jet Airways, IndiGo, and others are in huge financial debt, leading to a shortage of pilots and delay in the payment of salaries to pilots, staff and management. This has led to numerous cancellations in flights, and is further driving up the fares, thus inconveniencing flyers. According to a data by TeamLease Services, the Indian aviation sector is staring at a deficit of 500 pilots in 2019 against the 1,300 the airlines have on the roster now. There is a dearth of cabin crew as well-1350 short of the optimum 4900. To handle duties on the ground, there are only 9,200 personnel, compared with the requirement of 15,800. Also there has been a fall in job postings for flight attendants by 80 pc over the last five years starting from January 2014, and the steepest decline was seen in 2017 and 2018 when postings were down by almost 88 pc. A report by CAPA India, a specialist in aviation advisory has predicted that the Indian aviation industry will need more maintenance staff, pilots, security personnel and engineers by 2028 to sustain its growth. The report comes at a time when both full-service and low-cost carriers are facing mounting losses, operational and crew-management issues, rising ATF prices, and management-ownership tussle in some of the major airlines. Jitendra Bhargava, aviation author and former Air India official, believes the industry players have been overlooking the “reality of market dynamics” in their mad scramble for market share. “For too long, the industry players have overlooked the obvious reality of our market dynamics –passengers being hugely price sensitive and high operational cost platform. In the mad scramble for garnering or retaining the market share, airlines have been selling seats below the cost of producing a seat,” he said.